Our Lady of Lourdes | Flickr - Photo Sharing! "The primary purpose of the shrine at Lourdes is to be a place of encounter with God in prayer and a place of service to our brothers and sisters, notably through the welcome given to the sick, the poor and all who suffer. In this place, Mary comes to us as a mother, always open to the needs of her children. Through the light which streams from her face, God's mercy is made manifest. Let us allow ourselves to be touched by her gaze, which tells us that we are all loved by God and never abandoned by him!" 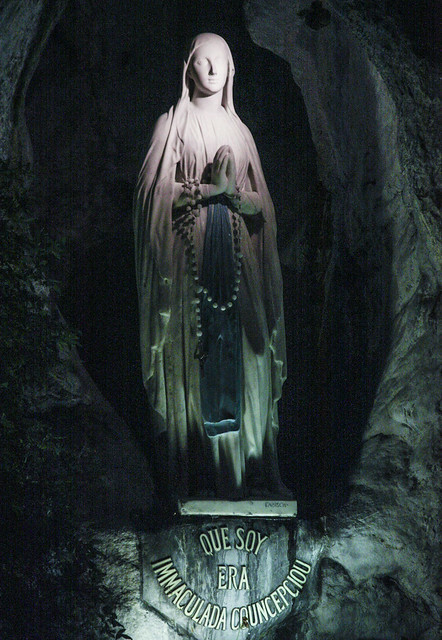 This statue of Our Lady of Lourdes stands in the rock of Massabielle, in the very spot where the Blessed Virgin Mary appeared to St Bernadette Soubirous 155 years ago in 1858. Today is the feast of Our Lady of Lourdes, and my sermon can be read here. SF_Catholic, Gacutan, kotraport, and 24 other people added this photo to their favorites. This is absolutely lovely, Father. Thank you for sharing. Thank you for the beautiful photo and information about Our Lady of Lourdes.